The Prochlorococcus Of Warming Ocean Waters (POWOW) series of cruises are designed to characterize the response the of phytoplankton, mainly focusing on Prochlorococcus, to temperature changes. 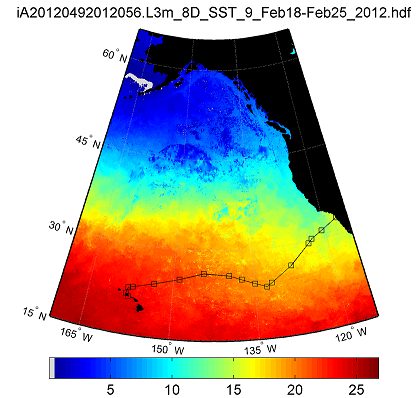 The goal of this research is to better understand and ultimately predict how temperature regulates the current distributions and activity of phytoplankton and to use this information to predict how this may change in response to climate change. This work is funded by US-NSF grant #1031064. Data is available through BCO-DMO under the POWOW project (#2237) website. POWOW#1 Cruise: February 29 – March 11, 2012 from Honolulu Hawaii to San Diego, California. This cruise of opportunity was used to refine hypotheses, develop methodology and train personnel for the two major POWOW cruises in 2013. 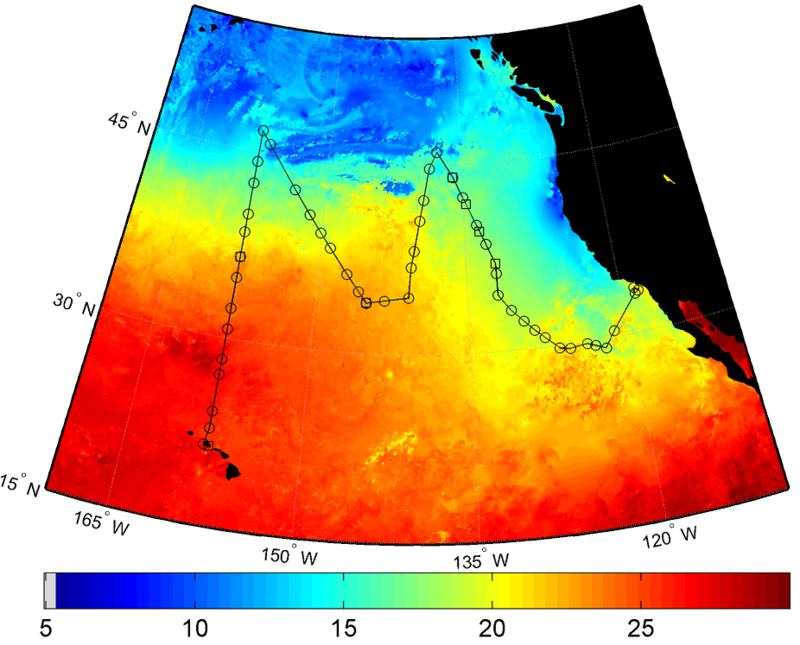 Along with expected gradients in sea surface temperature from Honolulu to San Diego, we found dramatic changes in how nutrients (NO3 and NH4) are distributed, ocean acidity (pH), oxygen concentrations, and in the distributions of phytoplankton populations. Seven undergraduates from the Duke Marine Laboratory were part of the science team as well as collaborators from University of Tennessee Knoxville, Colorado School of Mines, Marine Biological Laboratories, University of Washington, Pacific Marine Environmental Laboratory (NOAA) and Stanford University. 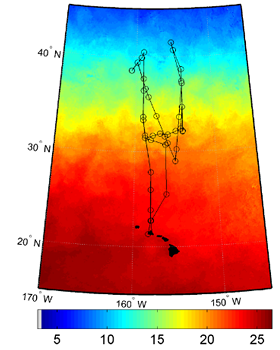 POWOW#2 Cruise: January 10-February 7, 2013 departing and returning to Honolulu, Hawaii traveled more than 5000 miles in the North Pacific Subtropical Gyre and dodged many major storms. The primary goal of this cruise was to measure the abundance, diversity and activity of Prochlorococcus and associated bacterial and viral communities across temperature (and other environmental) gradients to understand how climate change may impact ocean ecology and biogeochemistry in winter months. We also performed temperature shift experiments to experimental determine how changes in temperature affect Prochlorococcus and associated variables. Six undergraduates from the Duke Marine Laboratory were part of the science team as well as collaborators from University of Tennessee Knoxville, University of Washington, and the Pacific Marine Environmental Laboratory (NOAA). POWOW#3 Cruise: July 1-July 28, 2013 departing from Honolulu, Hawaii and arriving in San Diego, California traveled aboard the R/V Kilo-Moana in the North Pacific Subtropical Gyre. The final in this series of cruises, this occupation had the goal of measuring the abundance, diversity and activity of Prochlorococcus and associated bacterial and viral communities across temperature (and other environmental) gradients to understand how climate change may impact ocean ecology and biogeochemistry in summer months (and to compare results from colder waters found during POWOW2). As before, we performed temperature shift experiments to experimental determine how changes in temperature affect Prochlorococcus and associated variables. Four undergraduates, a high school teacher and numerous graduate students represented the Duke Marine Laboratory, University of Tennessee Knoxville, University of Washington, and the Pacific Marine Environmental Laboratory (NOAA) among other collaborators.